Anyway... this hat was totally and completely inspired by the hat frenzy that is happenin' by The Stylish Wanderer. I feel like hats are the perfect touch to a simple outfit, and are a great way to accessorize when on the go. Plus, sunhats kind of work like sunglasses except they are prettier. And yes, I am just a little obsessed with these acid wash jeans. 9 out of 10 times that I have been wearing pants as of late, these have been them. PS- The first picture is of my roommate. Isn't she adorable? Wearing: me- f21 top & jeans, thrifted hat; Ally- Chinese Laundry boots, Pency top, f21 tights. Yeah what the heck happened to April showers?? It is 103 right now in California. adorable roommate and adorable you! :D what a fresh and spring-like outfit! 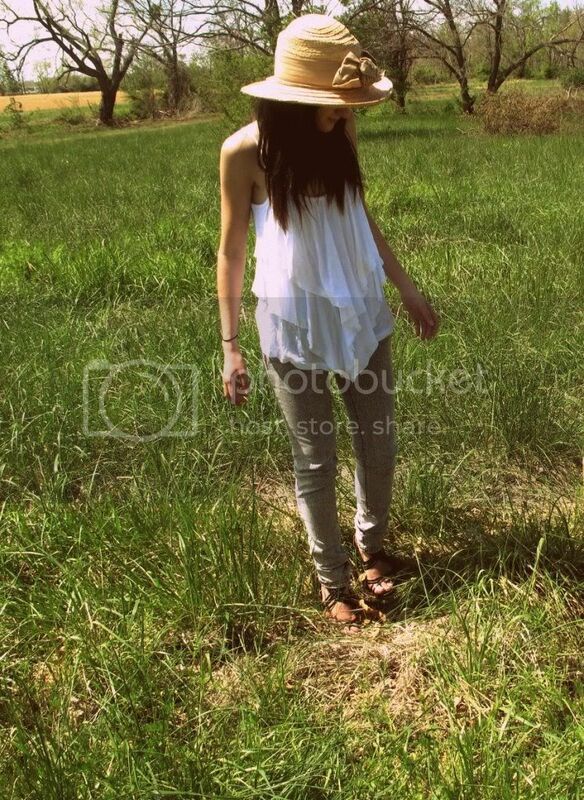 i can even say that it looks like summer :D i envy your jeans and the top is so lovely! such beautiful photos - absolutely adoring the first one! you are the cutest little thing!! 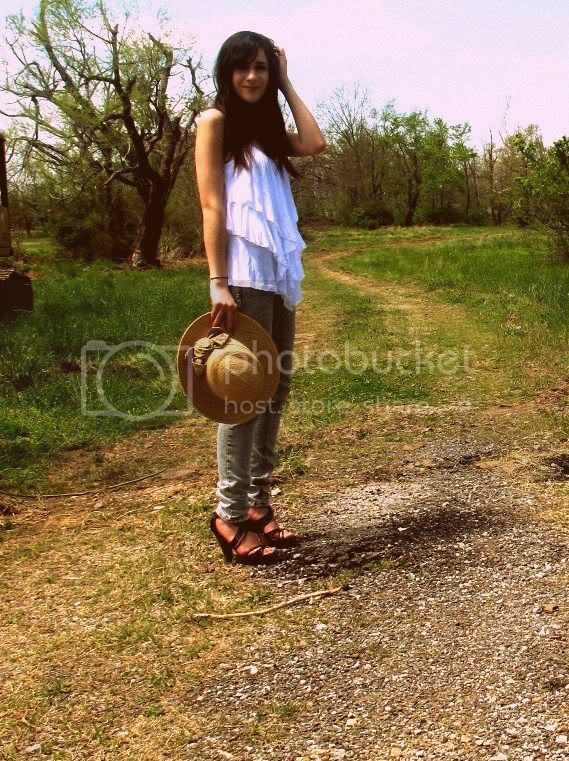 great summery pictures and i love your hat and white top, there gorgeous. you are adorable. and you're making me want dark hair again! so lovely! oh you two look adorable! the hat is so sweet! i hated feeling hot and sticky today too ugh. tres chic. incroyable. if that isn't the most adorable out fit ever. i love the look. especially the pants and the hat adds a nice touch. lovely look for a the boiling april heat. U are adorable and Ur outfit is really lovely! so pretty i love your hat! Love your top! It looks so pretty where you are too. GO HATS!!!!!!!!!!!!!!!!!!!! and yes! your roomate is adorable! I love love love your outfit. That top is so rad. Yes, I'm obsessed with a pair of jeans myself. LOL. Finding a great pair that you really like is quite hard. ooooh, you guys look so cute! love your outfit, especially the top. i saw the pictures and totally thought "very stylish wanderer" i agree, hats are divine, I really want the elaborate detailed hat trend to come back. we had gorgeous weather for two days but now we're back to rain, no suprise considering it's seattle. you two are pretty adorable together, your styles definitely mesh. i LOVEEEEE the layering of that top - super gorgeous. and i'm glad that hats are getting attention as a statement accessory! your outfit is too cute! especially love that hat with your top. very romantic. i'm in love with your style and your blog! white blouse is perfect! so romantic. You both are wearing the most perfect outfits for summer. I really need to get in on this cult hat trend. You guys pull it off so well. That shirt is lovely, too! I love that shirt and the hat is very cute on you. I'm definitely not a hat person, they never look good on me. I love the sun in April, but then I'm a summer person, I like thinking that it'll be hot for an extra month or 2. Oh and the shoes, very nice!!! I'm a total hat addict, I love the way they can transform an outfit. Yours gives such a nice romantic and springtime feel, Jane Austen's characters would have worn it to a picnic! Even in England we've been having almost a heatwave! I think we're going to get some april showers now though which feels a bit more 'normal' really. Your hat is so cute. I have a cheap straw hat I bought from a visit to the seaside that I want to jazz up with some ribbon and wear in the summer. a lovely day! it was hot here too which got me all frazzled because i was riding my bike around town sweating in my all black get-up! at first, i thought, oh that's stylish wanderer's hat. haha. you totally rock that one babe. You are so adorable! and i love the first photograph! what a beautiful outfit! the coloring of the photos are absolutely amazing. love it! you have beautiful pictures! :D i love your style. Hello, lovely blog! You have great style. You two look so cute. I love your hat and I love her top. Sunny days make everything better! 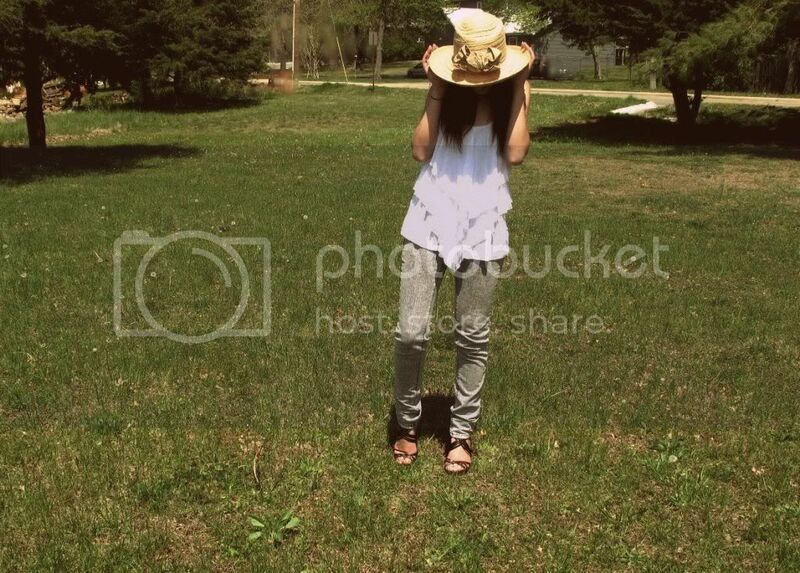 I NEED a big brimmed sun hat so bad! It's so hot. I'm loving it though. I need a cute hat, thanks for the reminder. I tagged you by the way. I hope you don't mind. I absolutely love your top and that hat!! Annd I am totally loving the warmer weather, I complained about the cold during winter, so nows my time to enjoy some sun lol. You look wonderful! And so does your roommate :) You seem like a stylish pair of friends! The jeans are indeed verrry nice, the perfect shade of grey! you guys look greatt! especially like your hat! you and your friends are both SOOO freaking cute. and this post reminded me of stylish wanderer, her picture colours and you covering your lovely face! straw hat! looks so classy! I really love the draping of that top! i heart your photos . it's really really really cool ! *hope we can be friends . your style is freakin cool!